In my work at St. Joseph Center and with my community, I see my program’s charism acted out in a few specific areas that I would love to explore. Changing world view: With the theme of unifying love behind all of my actions, I begin to see the issue of homelessness in a different light. It seems rather basic to imagine that I would begin truly seeing people who may often seem invisible, but the charism drives me to realize the true humanity and the seemingly small differences that ultimately separate my clients and myself. I’ve also learned the difficulties of “solving” the issue of homelessness because, though all people are linked, it is precisely that interdependence that ensures any efforts to solve this issue impacts all people. Realizing the connection between social justice and each individual person highlights the difficulty in approaching these issues, as well as the intense need for these changes to be brought about. Anh’s home state after Christmas. Living in solidarity: Because this love unites us all, the sisters’ charism teaches me to ask questions about our interdependence between people and the earth and to recognize the impact we make. For me this means thinking about how we live in our community, where we are getting our food and products from, and considering what must change in my life to help me better live for justice and the unification of all, even when the connections may be harder to see. Reflecting on low-harm foods, the free-trade movement, and workers justice, among other issues, has been fueled by my desire for social justice through the charism of the CSJ (Sisters of St. Joseph). on either side of the US- Mexican border. One specific example of the program’s charism that came to life in a tangible way was when I got the opportunity to travel to Nogales, Arizona and Nogales, Mexico for a Border/School of the Americas protest. Below is a video detailing our experience. Going to the border and walking straight into Mexico only to see the enormous border wall that separates these two countries was powerful. It made me question why, where God sees unity and similarities, we humans see division and difference. 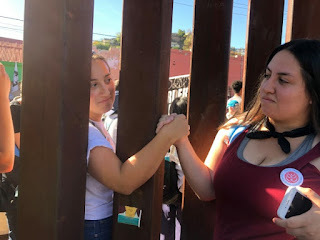 It was heartbreaking to understand the hardships of those affected by this wall. (See more at: https://vimeo.com/243165417). 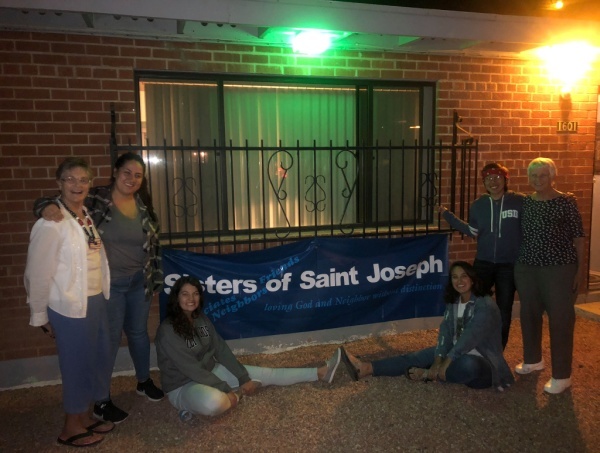 Community: The phrase “that all may be one” is what the Sisters of St. Joseph understand Jesus’ mission to be, and they try to continue this mission today. It underscores the connection each of our services and work has with each other, especially the work of the other volunteers in my community. Together, we are learning to live in an interdependent community where we are all responsible for each other, a concept that I didn’t understand as tying in to our work for justice. However, this unifying love extends beyond “service” and into life with those we interact with always. and Barbara’s home in Tuscon, AZ. My faith: My faith has been informed and shaped by the sister’s charism in a way that comes at a perfect time in this political climate we live in. I think it is a unique privilege to do a year of service at a time when tensions are high and hard issues are coming up more frequently. However, I’ve found that this is also a challenging time to have faith, especially when dealing with the intense suffering of those experiencing homelessness in LA. 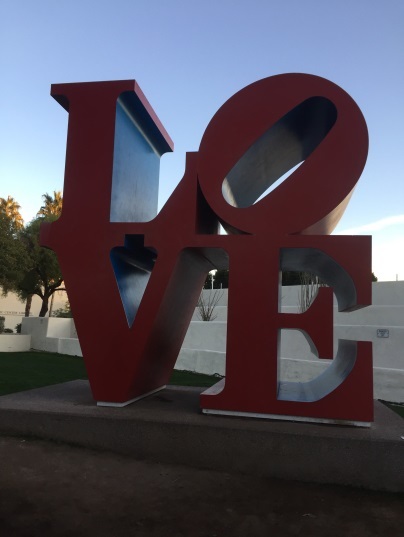 Unifying love is the opposite of what we hear continuously on the news and from each other, and is often opposite of what my clients are experiencing. However, this charism changes my perspective of God; I see my role in continuing Jesus’ mission as opposed to waiting for God to solve all the problems. Furthermore, I think this charism urges me to focus my faith on the world and the larger population rather than on myself. My vocation: The quote above is an incredible statement about the charism of the sisters and of the St. Joseph Worker program. It helps me when I consider my journey of discernment. I have moved past an idea of vocation as a job or a position, or even the choice between married or religious life. I have started to imagine my vocation as what I am called to be in all areas of my life, and this love that is fearless and inclusive has driven me to consider how I am like that in my relationships, my job, and with myself. I have seen this love when I am working at St. Joseph Center and it urges me to consider where I can more aptly display it in a way that feels comfortable for me in the future. I wonder if social work is the career where this can happen for me, leading me on a path of discerning my career as part of my vocation. I am grateful that through each step of this program, the charism of unifying love in serving the neighbor is there to guide me.